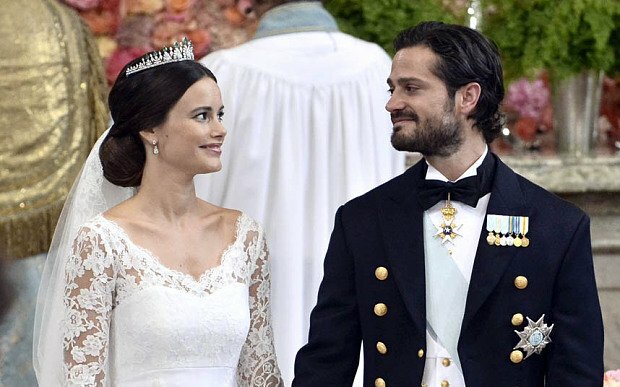 Prince Carl Philip of Sweden has married former reality star Sofia Hellqvist in a lavish ceremony in the chapel at Stockholm’s Royal Palace. Sofia Hellqvist, 30, worked as a model and a yoga instructor before helping to set up a charity. Prince Carl Philip, 36, is third in line to the Swedish throne. Thousands of well-wishers lined the streets for the event, despite polls suggesting the Swedish royal family’s popularity is waning. They cheered as commoner Sofia Hellqvist became a princess. After their marriage, Prince Carl Philip and Sofia Hellqvist took to a horse-drawn carriage to parade through the cobbled streets of Stockholm’s old town, waving to crowds in the hot summer sun, before returning to the palace for a 21-gun salute and wedding banquet. About 550 guests attended the ceremony, many of them royals, including Princess Takamado of Japan and Britain’s Prince Edward. Prince Carl Philip was initially reported to have had difficulties putting the ring on the bride’s finger while the royal couple said their vows. A band played a version of the Coldplay song Fix You in the royal chapel, and the newly weds were then serenaded by a man singing a Swedish version of the song Umbrella by Rihanna. Sofia Hellqvist and Prince Carl Philip reportedly first met at a restaurant in 2010, with news of their relationship being revealed soon after. Prince Carl Philip is third in line to the Swedish throne behind his elder sister Crown Princess Victoria and her 3-year-old daughter, Princess Estelle.